I love baby blankets. 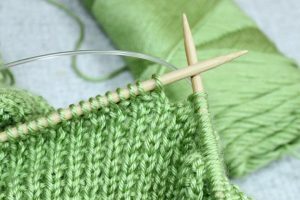 I love that they’re a simple square with no shaping; I love that there’s so much room for creativity within them; I love that they’re so much smaller and faster to finish than a full-sized throw. My kids love their baby blankets too–Munchkin is still small enough to sleep with his (his two favorite blankets “belong” to his two favorite stuffies), and Little Bear loves to make nests with any blankets he can get his hands on. 1. 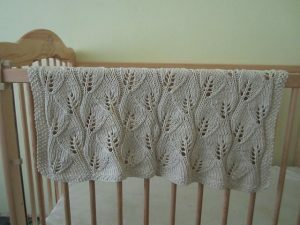 I love the lacy leaves of the Leafy Baby Blanket by Leyla Alieva. It would be gorgeous for a forest, jungle, or garden nursery. 2. 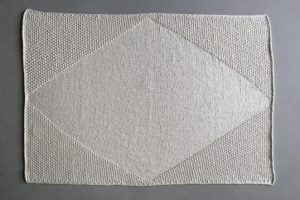 The textured corners of Purl Soho’s Cozy Corners Crib Blanket make it unique but still simple and uncomplicated. 4. I love (love love!) 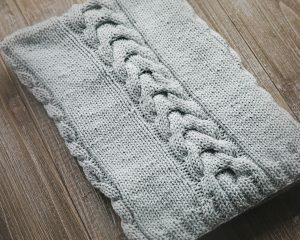 the simple stockinette stitch and cool chunky cables of the Country Bliss Baby Blanket by LeeLee Knits. 5. The Newborn Baby Blanket by Altadena Green is so beautiful in its simplicity. I love the texture of the stripes and how versatile the design is. 6. 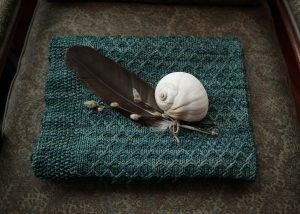 I love the mythical, oceanic feel of the Llyr Baby Blanket by Nat Raedwulf. It’s a simple yet striking pattern that is a definite keepsake. 7. 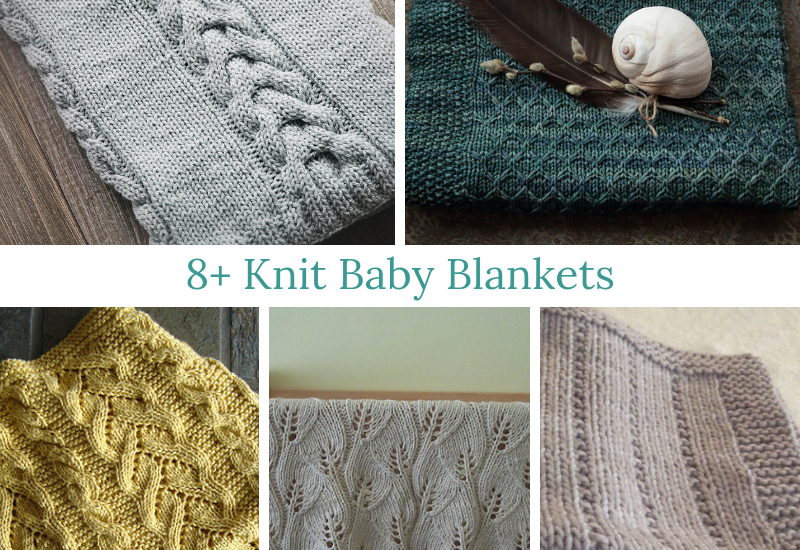 Moving away from simplicity, I love the Fancy Cables and Lace Baby Blanket by SweaterBabe. 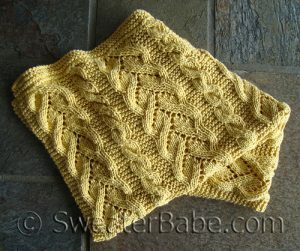 I love cables; I love lace. Combine them into a gorgeous blanket? Yes, please! 8. 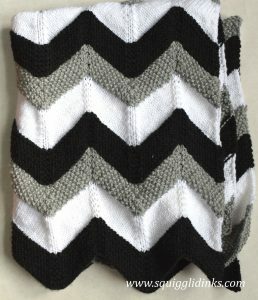 I still love the texture and chevron combo of the Himalaya Blanket that I made for my friend’s little boy back in 2017. It was a lot of the same increases and decreases, but the changes in texture and color kept the knitting from getting boring. Or you could go with the softer, more delicate lines of the Sugarplums Blanket by Danielle Chalson–it’s classy and sweet, and I can just see a little one snuggled up with it. If you want to go with the ultimate in simplicity (or you need a baby gift pronto), check out Lion Brand Yarn’s Diagonal Comfort Blanket. I’ve knit garter projects corner-to-corner like this–they’re easy and fast, but they’re also super cozy. 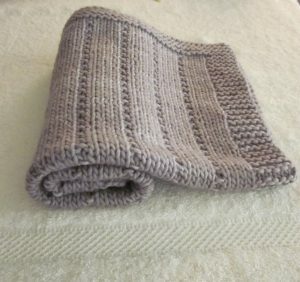 I also came across this roundup from In the Loop Knitting of baby blankets with patterns that only have 4-row repeats. Some are lacy, some are not, all are adorable. Do you love knitting baby blankets? What is your favorite gift for a new little one? Tell me in the comments!